The decade of the 1990s in Ecuador was marked by social tumult and rampant economic inflation, culminating in January 2000 when President Mahuad, acting on the advice of the International Monetary Fund, instituted stringent austerity measures that included the replacement of the traditional Ecuadorian currency, the sucre, with U.S. dollars as the legal currency. The transition was not easy. This unusual and incisive documentary explores in depth the effects of the transition on Ecuador’s native people, featuring indigenous people from the mountains as they comment on the government’s policy. Sensitively filmed and deftly edited, Gringo Kullki powerfully demonstrates how the gringo money created hard times for the indigenous people. The brightly colored sucre bills were replaced with paper money of just one color: green. Indigenous elders were confused in their daily buying and selling in the market. Often they were deceived in the change of currency. And who were the people represented on these new dollars? Faces on the old bills were familiar Ecuadorian heroes: Rumiñahui, who battled the Spanish conquistadors; Alfaro, who liberated the indigenous people from a life of serfdom. Instead, native people see a 5-dollar bill that features an unknown, angry-looking man with a furrowed brow (Lincoln). Native people felt cheated: a 5-sucre bill used to buy enough food for a family; with dollarization, now it barely served to buy lunch. In their native language (Quechua), indigenous Andean men and women voice their perspective on the difficult adaptation to a new monetary system. At times poignant, at times humorous, but always illuminating, Gringo Kullki will motivate thought and discussion in a wide range of classes in Latin American and Andean studies, cultural anthropology, global and development issues, and human rights. It was produced by Professor Emerita Regina Harrison, noted Quechua specialist and documentary filmmaker at the University of Maryland, and filmed by Prof. Harrison and Sami Ayriwa. 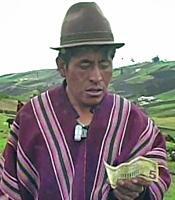 In Quechua, with English subtitles.